Dalleer is one of the biggest cities in the east. It resides mostly on the eastern side of the Black River, but some citizens live and work on the western bank across the Bat Bridge. Slight amounts of the black coal in the river are still visible by the time the water reaches Dalleer and the mirror quality of the water is retained as well. The walls of Dalleer are fourteen feet high and made of granite stone with trace amounts of iron in them. The blocks made for the wall were sent downriver from Restnor’s Point. Dalleer has a population of about 160,000 people. Most are Humans; but as always, some other races are present. There is almost no unemployment in the city. The government offers numerous repair and civil improvement jobs to those out of work. There is ample space to expand agriculture work around Dalleer as well. The staple diet in Dalleer is bread made from the wheat grown along the rich Black River. Enough wheat comes from the farms to export some to the Aractrashans in the south. The meat in a Dalleran’s diet is steak from the cows in the city’s fields and mutton from the sheep of Shalerton. The people of Dalleer are known for their individuality as well as military strength. The city has a well kept and well paid military and police force. They have eliminated most crime, but have been unable to stop the thieves of the world from burglary. Anybody capable of divination is likely to get a hiring call from the Dalleer Police (DP). The General is Sir Trustgard, the Cavalry Colonel is Sir Mark, the Street Warden is Sir Tucker, the Wall Commander is Lady Discoma, and the Jail Warden and Public Prosecutor is Sir Marius. Dalleer’s system of government is an appointed dicatorship, where the previous ruler appoints the next. The leader bears the title of Björn and is considered a divine entity. This was started by the first leader, named Björn, who built the walls of the city. He enjoyed immense popularity, but was senile in his late years. As such many strange customs are now still practiced because, “Björn couldn’t have been wrong, could he?” Due to the appointed nature of the office, the insanity is often carried over into the next leader. While the Björn is nominally in control a council of elected politicians is the true power in Dalleer. The judicial system is sufficiently fair. The only problem is it’s stance on heresy and treason are relatively harsh. The punishments are torture for an amount of days proportional to the amount of damage caused by the individual. Thankfully such crimes are not commonly committed or reviewed. The current Judge is Sir Balander. 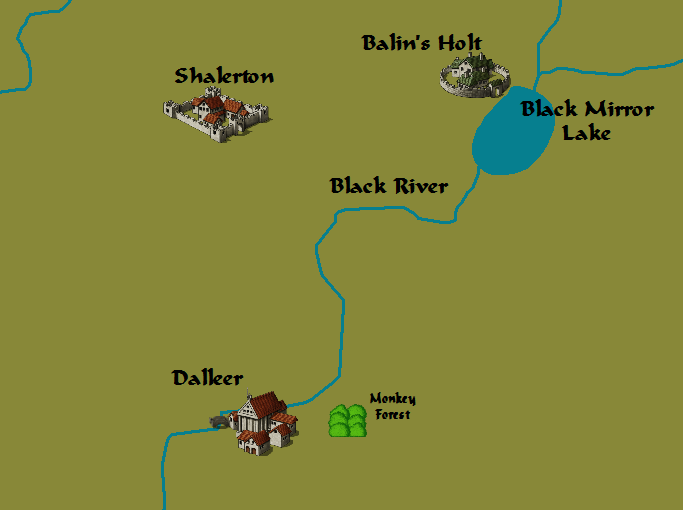 The main buildings in Dalleer include the largest pantheon temple in Cimmeria, Dacklack’s Armory, The Inter-Racial Coalition Headquarters, The Brown Library, and Tremble’s Race Course. The pantheon temple in the town is forty feet high with statues close to that height in the main chamber. The temple has a magical effect that makes it appear as if someone is alone in the temple save for the people they entered with and the priests. The illusion is self-preserving and will anticipate any mistakes. Dacklack’s Armory is similar in looks on the outside to an 1840 factory. The smoke billowing out of the roof comes from the twenty forges inside. The brick construction is necessary to protect the building against fire. Dacklack’s grandson, Jormunger, runs the Armory. His first responsibility is to provide the DP with whatever they need to keep the city safe. He gives DP members discounts. Jormunger was a master smith before taking over administartion of the factory from his father. He still enjoys filling special orders for unique weapons and armor himself. The Inter-Racial Coalition Headquarters is a large bar, inn, restaurant, park, and guild training area for all races to meet and develop respect and tolerance for each other. The head of the organization is Kig Yupington. He created it to help the different races come together peacefully and as a good experience for people in their youth. His own race is unidentifiable. Pointy ears of an Elf, stocky body of a Dwarf, hairy feet of a Halfling, tusks of an Orc, and blue eyes of a Human. He is a mystery that even magic has been unable to solve and something the gods refuse to reveal. The Brown Library is the largest collection of books in the world. It has a restricted section for spells and a no rental policy unless you get a library card. Getting one is as easy as telling your name and giving one strand of hair to the desk clerk. The restricted section is much harder to get access to. It is locked with a powerful magic spell and requires an extensive character test before being admitted. You may only rent one book at a time and may keep it for up to a month before returning it. Spellbooks and scrolls must have a deposit put up before they can be rented. Tremble’s Race Course is a place of gambling. The track usually has a horse race every day. The infield has an iron fence around it and many obstacles for the gladiatorial fights that take place within it. The betting parlor is connected to a magically warded casion. Any cards, dice, or luck altering items that are brought into the casino glow red. Any abilities used to influence the throw make the caster glow red. Cheaters are thrown out of the casino and forbade to return to Tremble’s Race Course ever again. Various beasts and slaves are kept below the arena ready for combat and races. The current champion of the arena is a fire giant named Hoyt. He uses his feet most of the time, but will use a glaive if his opponent is near to his size. He often faces more than one opponent to liven up the matches. The racing champion changes day by day but the notables are Dangal on Hoofbeat, Tiana on Harver, and Unglit the halfling on Joyride. The announcer for the track and arena is Tremble’s daughter, Halfax. She learned from her father, one of the best announcers in Cimmera and she has an amazing voice that matches his in color and timbre. If Björn is not present to render a verdict on a gladiator match then Halfax is honored with that right. In recent history Dalleer joined the Second Alliance War against the Xorians. Dalleer sealed their entrance into the Alliance by the marriage of the current Björn to Cassandra, the daughter of the now dictator of Bradel Fields, Astyanax. 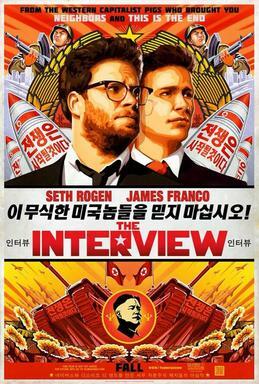 There’s a new movie coming out in the USA on October 10th 2014 called The Interview. The movie is getting a lot of press because of the unusual plot. In The Interview two journalists travel to North Korea and attempt to assassinate Kim Jong-Un. This has obviously upset Kim Jong-Un and some North Koreans. Every major news company has released something covering the North Korean response. Here’s one of the articles I read put out by CBC. Seth Rogen is apparently a provocative, insane, gangster filmmaker (Provocative for sure, but the other statements are just insults). And the final point, North Korea will view the release of the film as an act of war. If that’s taken seriously, then North Korea intends to declare war on the USA because we didn’t censor a film. Granted the film is highly offensive to North Korea, but that’s only because the North Korean administration doesn’t understand how free speech works. If we censor the film then what other films should we censor? Should Olympus Has Fallen have been censored because it portrayed the North Koreans attacking a fictional US President? No. And perhaps that’s the point of it. Past movies of this kind have always dealt with fictional leaders of countries. The person at risk is never the real President or the Supreme Leader of North Korea. It’s always some random person in an alternate past or unknown future. And I think Seth Rogen wrote his script with the actual leader because he knew this type of response was coming. He knew the North Koreans would flip out and make a statement of some kind. And he knew that other news networks would pick up the story. And now his film gets free international publicity. It may be provocative and insulting, but it was also a smart business decision. Anyways, I doubt North Korea will attack the USA once the film is released. More likely they will use this as their excuse to launch missiles at South Korea this year. There will be a tense standoff and then once again nothing will be resolved in the eternal Korean War.